It’s a very different day in Virgin Gorda, as day two of the Loro Piana Caribbean Superyacht Regatta – Oil Nut Bay Race Day – gets underway with showers and variable breeze coming in from the east. As owners and their guests awake after the thrill both of day one’s racing and of last night’s Loro Piana Owners’ Dinner – where renowned soprano Maria Luigia Borsi wowed guests with a mix of musical numbers and classic arias – all talk is of what the racing today will hold. ‘I think the weather today will keep us busy, with possible shifts under the squalls’ says Jasper Emmer, boat captain on Drumfire. At 24 metres, Drumfire is one of the smallest yachts in the fleet and as a result is one of the first to start in the time-on-distance pursuit format. ‘Being the smallest and starting first is a good feeling, but you know the bigger yachts are coming!’ he laughs. The variable conditions will also be a good test of the new ORCsy superyacht rating rule, which is making its world debut at this event. Competitors and spectators alike will be hoping for a repeat of yesterday’s thrilling finish, which saw the top yachts in both Classes cross the finish line within seconds of each other. The race committee has set a custom course for both Classes, at around 28 miles for Class A and 23 miles for Class B. Follow us on Twitter at @boatint and on social media for live updates from the race course, and track the fleet’s progress live here on the YCCS site. 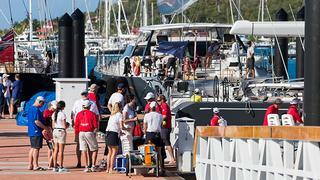 For yesterday’s results and a full Day One race report, head to the Loro Piana Caribbean Superyacht Regatta website.